If you've been asked to supply artwork to us, you may have heard the term, "vectorised artwork". Usually a computer image is made up simply of pixel or dots. If we try to zoom in on this image it simply becomes blurry. See the image of the two letter Bs. When we open an image and zoom in, the top image is an example of what we see. If the image is of a high enough quality, we can scan to a vectorised format, however this is not ideal. A vectorised format, as per the two lower letters, can be scaled to any size without losing definition. The letter is actually defined as a shape rather than a text character. JPG, TIFF, PNG, GIF or similar format files are always made up of pixels rather than vectorised images. PDF or Illustrator ready files can be made up of either. 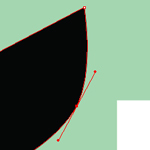 If you have a PDF to send over, some graphics companies supply these simply as a JPG (or similar) file within the PDF. To test if the image is vectorised, simply try and zoom in on a word or piece of text. If the edges of the text keep their definition and have no blurry outline at all, it is most likely a vectorised image. Beckdale offer a full design service for retail vector artwork. Beckdale.co.uk employees assist throughout, helping managers design unique vector artwork. To start designing your choose by material or different styles of , get in touch with our team using the above details.